Mahamudra Prayer of Rangjung Dorje. That I may attain accomplishment in accordance with my aspirations. Flow into the ocean of the four kayas of the victorious ones. But enjoy this splendorous ocean of happiness and virtue. We have followed an eminent spiritual guide and received the nectar of oral instructions. May we, in all our lives, practice the sacred teachings. By learning the scriptures and through reasoning we are freed from the veil of ignorance. Through contemplating the oral instructions we overcome the darkness of doubt. With the light resulting from meditation we illuminate the natural state as it is. May the light of this threefold knowledge increase. We attain the fruition of the two benefits free from the extremes of existence and peace. May we connect with such a teaching free from error. The ground of purification is mind essence, the union of being empty and cognizant. That which purifies is the great vajra like practice of Mahamudra. All the passing stains of confusion, that are to be purified. To have cut misconceptions of the ground is the confidence of the view. To sustain that undistractedly is the key point of meditation. To train in all the points of practice is the supreme action. May we possess the confidence of view, meditation and action. All phenomena are the illusory display of mind. Mind is devoid of' mind'- empty of any entity. Empty and yet unceasing, it manifests as anything whatsoever. Realizing this completely, may we cut its basis and its root. This dualistic fixation has made us wander in the sphere of samsaric existence. May we cut ignorance and confusion at the very root. It is not existent since even the victorious ones do not see it. It is not nonexistent since it is the basis of samsara and nirvana. This is not a contradiction, but the Middle Way of unity. May we realize the nature of mind, free from extremes. Nothing can illustrate it by the statement, "this is it." No one can deny it by saying, "This is not it." This nature transcending concepts is unconditioned. May we realize this view of true meaning. Without realizing this, we circle through the ocean of samsara. When realizing it, buddhahood is not somewhere else. It is completely devoid of "it is this" or "it is not this." May we see this vital point of the all-ground, the nature of things. Perceiving is mind, being empty is also mind. Realizing is mind, being mistaken is also mind. Having arisen is mind, having ceased is also mind. May we cut through all our doubts concerning mind. Being able to rest in unfabricated and innate naturalness. The fact that there is nothing to see is vividly seen as it is. May we unmistakenly recognize our own essence. When observing objects, they are seen to be the mind, devoid of objects. When observing the mind, there is no mind, as it is empty of an entity. When observing both, dualistic fixation is spontaneously freed. May we realize the natural state of the luminous mind. Being free from mental fabrication, it is Mahamudra. Devoid of extremes, it is the Great Middle Way. It is also called Dzogchen, the embodiment of all. May we attain the confidence of realizing all by knowing one nature. Great bliss, free from attachment, is unceasing. Luminosity, devoid of fixation, is unobscured. Nonthought, transcending the intellect, is spontaneously present. Without effort, may our experience be unceasing. The fixation of clinging to good experiences is spontaneously freed. The confusion of "bad thoughts" is naturally purified. Ordinary mind is free from acceptance and rejection. May we realize the truth of dharmata, devoid of constructs. The nature of all beings is always the enlightened state. But, not realizing it, they wander endlessly in samsara. May overwhelming compassion arise in our minds. In the moment of love the empty essence nakedly dawns. This supreme path of unity, devoid of errors. May we attain the buddhahood of having accomplished ripening, cultivation, and perfection. 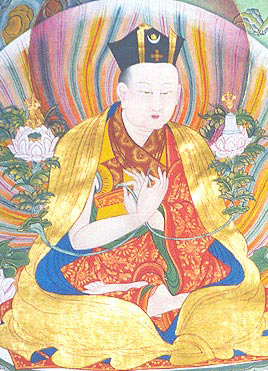 Ετικέτες Mahamudra Prayer of Rangjung Dorje.